Amuma Says No of Boise, Idaho also performed. 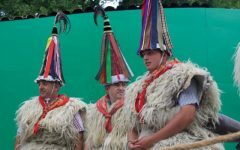 I was incredibly moved to see my culture — the Basque culture — on display at the recent Smithsonian Folklife Festival in Washington DC in July 2016. 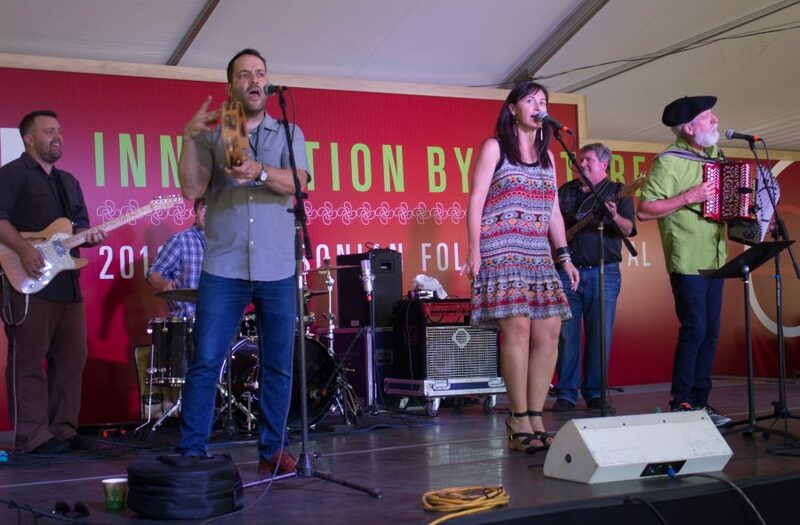 The Smithsonian Folklife Festival: Basque, Innovation by Culture included the best of the Basque world. 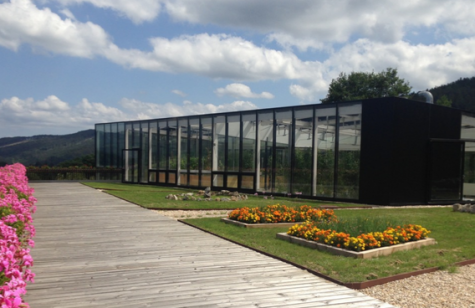 It was an intense experience where Basque-Americans like myself saw our culture through the eyes of an international audience. Did you attend the 2016 Smithsonian Folklife Festival? 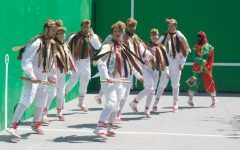 The two-week festival, located on the National Mall, midway between the Washington Monument and the U.S. Capitol, provided a heady backdrop for folk dancing, log chopping and pilota. 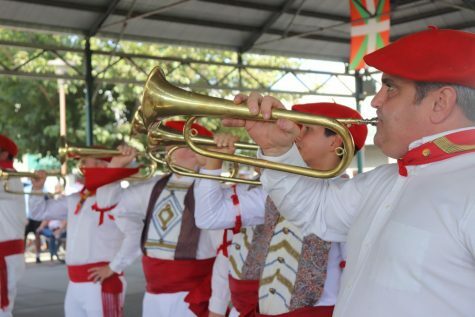 Usually we see these activities at festivals attended largely by Basque Americans. Gauden Bat dancers from Chino, Calif. are proud of their performance at the Folklife Festival. 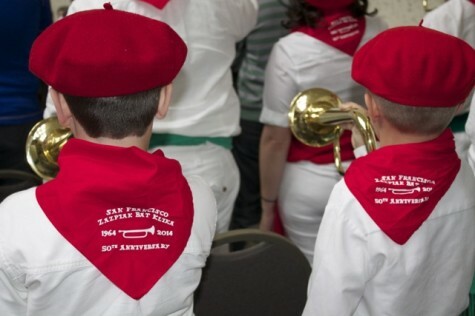 The festival, so highly organized, reflected every important aspect of the Basque people and their heritage. I have to hand it to the Smithsonian Institution. They know how to do things right. My husband, who lived in Washington DC for a year during college, had told me that the Folklife Festival was the best festival he ever attended. He was right. It was amazing to see so many people interested in the Basque culture and asking many questions. The Smithsonian did an outstanding job developing informative exhibits and finding the appropriate people to explain and demonstrate the different Euskaldun traditions. 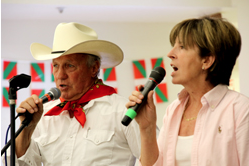 Emcees Xabier Berrueta and Esther Ciganda, who know pilota backwards and forwards, entertained their audiences while imparting key info about the cultural pastime. 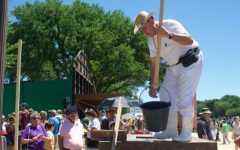 On display were cheese making, salt harvesting, wooden boat building and more. Onlookers filled the kitchen’s benches all day long, watching the chefs cook one recipe after another. Several stages, including a wooden handball court built especially for the event, hosted dance groups from Chino and San Francisco, Calif., Elko, Nev., Boise, Idaho and Salt Lake City, Utah. Happily many groups were able to raise the funds needed to make the trip to the nation’s Capitol to perform their traditional folk dances. 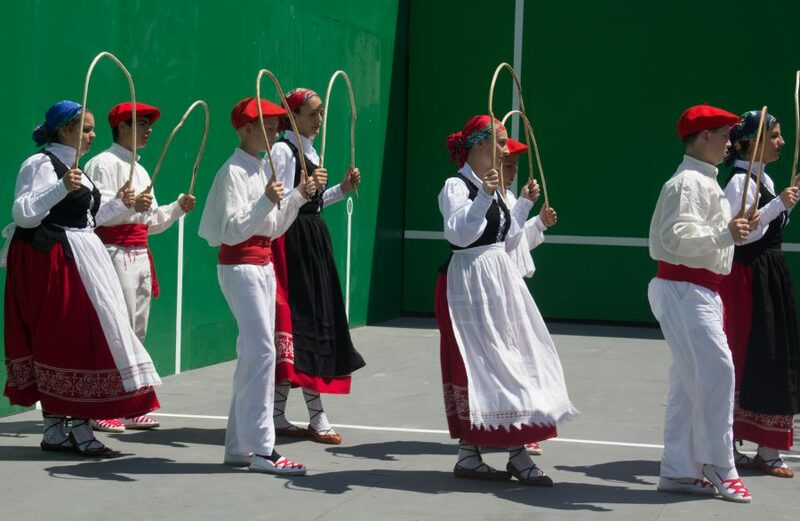 The dance group Aukeran from the Basque Country astounded the audience with their high kicks and precise heel clicks. 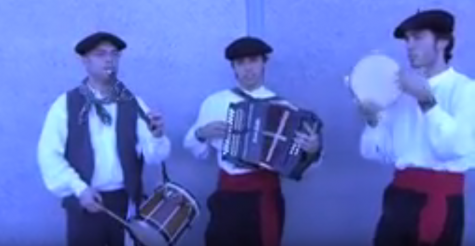 Musicians included the best the Basque Country offers: Kepa Junkera, Kalakan, Mikel Markez and Gatibu from the Basque Country. 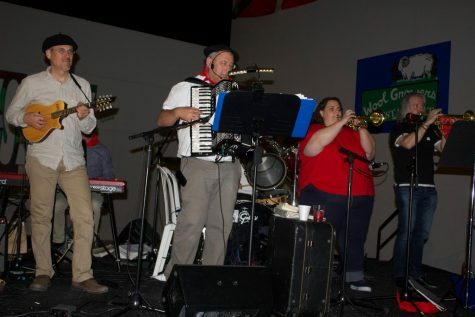 Boise, Idaho sent the Biotzetik choir and the popular rock band Amuma Says No. The vocal trio Noka from Chino, Calif. not only performed at the festival, but also had concerts scheduled at the Kennedy Center and the Library of Congress, expanding the culture’s reach. The opening ceremony, in the Smithsonian’s Art and Industrial Building, included political dignitaries from the Basque Country, and an emotional speech by U.S. Rep. John Garamendi, the highest ranking elected official of Basque descent. 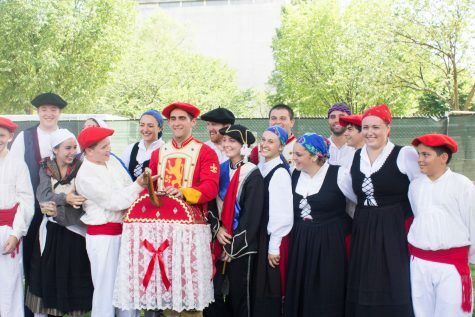 “The Basque people and the culture will be strengthened by this festival,” Garamendi aptly predicted. Of the 330 festival participants, 70 percent were from the United States, said media representative James Mayer. 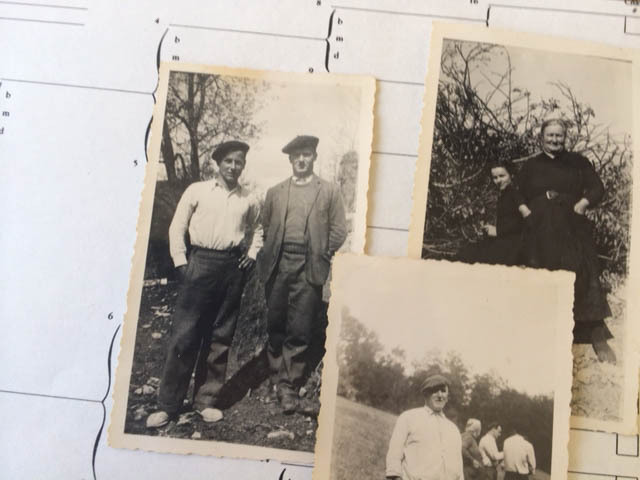 The Smithsonian put up most of the participants at the Key Bridge Marriott hotel, in nearby Rosslyn, Virginia, and a fair amount of socializing occurred there — a bonding experience for U.S. Basques and Basque Country participants alike. Glimpses of Kepa Junkera checking his cellphone in the lobby, and poolside chats with friends from back home added to the sense of community. Dinner on the waterfront with the families of Gauden Bat dancers on a warm summer evening was delightful enough, but it became even more fun when a summer storm drove our large crew inside. I often hear Basques reflect on how small their world is, because when they meet a fellow Basque they eventually learn they know someone in common. That same principal applied to the festival participants. We jumped on the participants’ bus from hotel to festival and enjoyed conversations with Basques from different parts of the world. 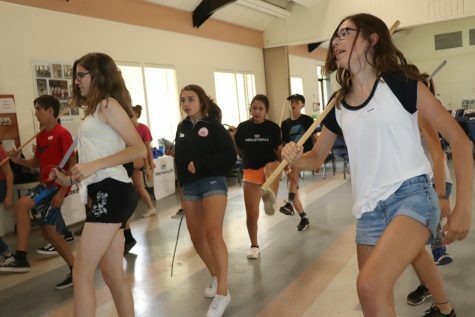 My son, Diego Lopez-Zubiri, 14, had the luck to perform his very first time with Chino’s dance group Gauden Bat in front of this national audience. Earlier this year, I had to bribe him to join the group. Here in DC, with dozens of people watching every performance, he finally understood how special these dances, this culture was. Watching him dance the ancient dances of our forefathers, there, on the fronton, with the U.S Capitol in the distance, brought tears to my eyes. Chino Basques who were in DC for the event turned up for the Gauden Bat performances — so far away from home, yet so close. I have promised myself that I will learn Euskera. So of course, I stopped at one of the Euskera language lessons that were offered continuously throughout the event. While I spent less than an hour there, I was happy to come away with some practical phrases. That first night of the festival, Kepa Junkera and Sorginak (the witches) performed on a stage set up on the grassy mall. Junkera’s trikitixa music was intoxicating and before long, a large circle formed as Basques heard the jota and ran to join in. 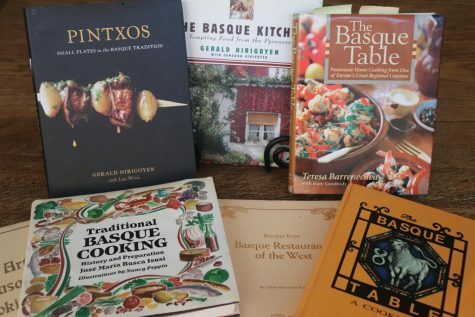 As a journalist who runs a Basque news website, I obviously have more than an average interest in Basque culture. I would have been happy to attend the entire festival every day from morning to night. But unfortunately, we had to catch a plane. I would have liked to see Kalakan, San Francisco’s Zazpiak Bat dancers and the Bakersfield Klika. But I was happy with the days I did get. When we returned home, my son was dancing Basque steps around the house and playing Kepa and Mikel Markez’ music late into the evenings. 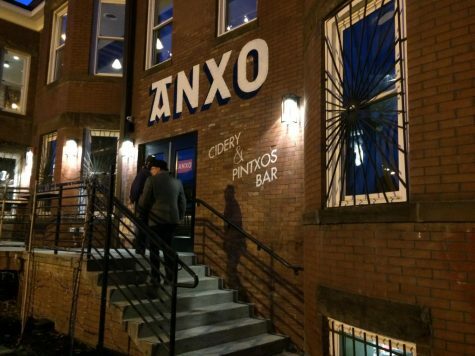 We have had an ongoing joke for years that my kids can quit Basque dancing when they can dance an entire jota, or fandango, without any other dancers nearby to prompt them on the steps. 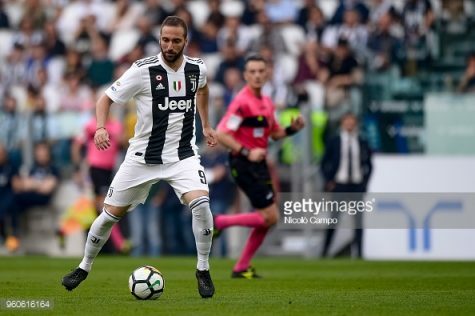 One warm evening after we returned home, my son played a jota by Kepa and without my saying a single word, my daughter, son and I began dancing. My joy was complete.